The human on this side of the blog absolutely loves animals to distraction. I just get totally lost while looking into the face of an animal, bird, dolphin, shark, or even spider. Yes… I love spiders, too. Phenomenal little workers! 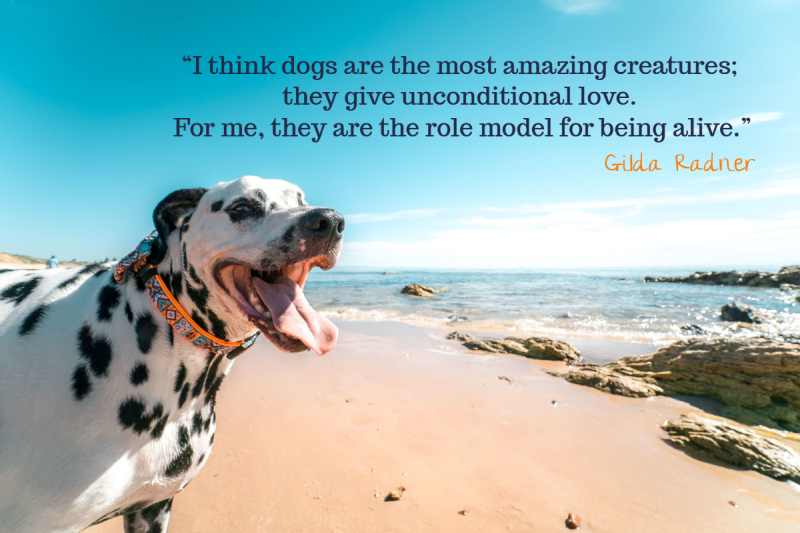 Animals are, bar none, the best therapists on the planet. I recommend rescue pets so often in my articles you’d think I WAS a rescue pet. Whether it’s loneliness, empty nest syndrome, grief, or simply a case of pursuing more happiness…. very, very, very often animals are the answer and the question is irrelevant. The more attention we animal lovers bring to animals, the more we can help them. While they certainly have voices (my cats particularly love proving this around 3:00 am), they don’t possess the vocabulary to tell humans around the world that they deserve to be treated with love, kindness, and respect. They don’t have the words to say, “If you let me into your life, I’ll give you more joy than you ever thought possible!” They rely on us to get the word out! Abraham Lincoln said it best, “I care not for a man’s religion whose dog and cat are not the better for it.” Love that! I’d love to tell you about a website for dog lovers – Diamond Pup.com. The website covers dog food, health, grooming, accessories, apparel (you won’t believe how adorable the pictures are! ), breeds, behavior, training, bedding, supplements, and a lot more. Why Do Dogs Wag Their Tails? Tips and Tricks to Make Being Home Alone Less Stressful for Your Dog. How Your Dog’s Behavior Can Change with Age. Teach Your Dog to Stop Begging for Food. What is Small Dog Syndrome and How to Deal With it. 10 Oldest Dog Breeds in the World. Do Dogs Feel Guilt? Everything You Need to Know. It’s just a really well-done website for dog lovers and I know you’ll enjoy it. 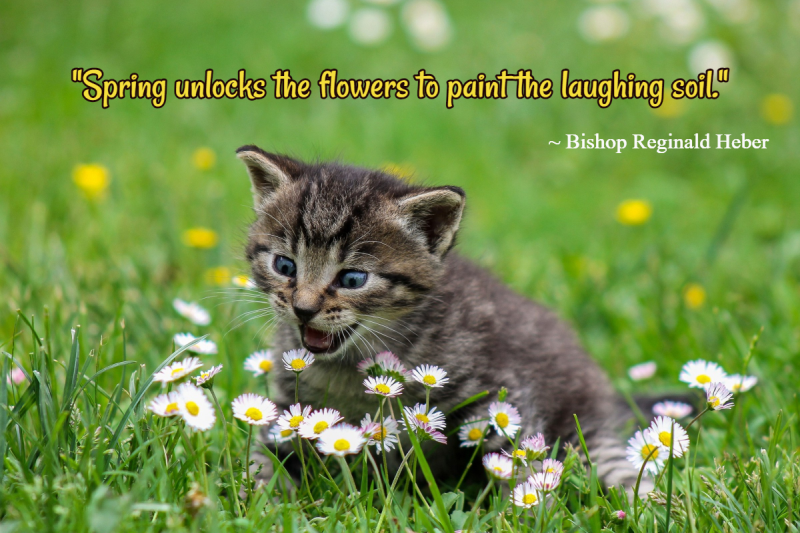 Four things I am BEYOND obsessed with are cats, flowers, laughter and spring…. so the graphic and quote above? It’s so “me,” I may as well be the cat! Spring is a perfect time for cleaning out the cobwebs, and I don’t mean just the ones in the corner on the carport. Although they have got to go. If spring were a holiday, she’d be New Years Day, for sure. It’s a time of cleansing, reevaluating, and, for lack of a better term, coming back to life. Everything comes back to life in the springtime – trees, yards, flower beds… even songbirds suddenly remember they have a song to sing. The same can be true of us as well. Things we’d like to change? What better time to attack them?! If we’d love more happiness in our lives… what better time to invite it right in?! Take this spring and make it what you want it to be. It’s yours after all. Flu Season Isn’t Through With Us Yet… Don’t Drop Your Guard! A month ago, I had Flu A AND Bronchitis (I guess my body couldn’t decide between the two and went with both). It hit me like a semi truck! I tend to get bronchitis any time I get a cold, so I knew what that was. However, I get the flu vaccine every single year (including this year), so having the flu was an unpleasant surprise. Fortunately, since I’d had the vaccine, the duration for my flu was shorter than it typically would’ve been. I still swear by the vaccine – I have gotten one, annually, for over 12 years and this is the first year I’ve gotten the flu. I’ve noticed a lot of people seem to think that flu season is over and that the risk of getting the flu is non-existent if you’ve had the flu shot. That’s the kind of thinking that’ll lead you to the ER. The flu season is still in swing and, to be honest, may even be more easily spread since so many people are dropping their guard. Make sure you (and everyone you care about) are still frequently washing your hands and practicing excellent flu-prevention habits. Always wash your hands after you’ve touched anything handled by others..
Below is a news release that will really drive the point home. The flu can be extra dangerous for children, people with pre-existing diseases or conditions (asthma, diabetes, heart disease..), and the elderly. MEMPHIS, TENNESSEE – The Centers for Disease Control and Prevention released its most recent Weekly Flu Report, indicating that flu activity remains high across the nation, with nine new deaths of children and over 321,000 flu-related deaths between October and March. The report also indicates that there has been a shift to the more harsh H3N2 strain of influenza in the Southeast. Richard Webby, Ph.D., a member of the Department of Infectious Diseases at St. Jude Children’s Research Hospital, again urged all Americans to get a flu shot and that is it not too late. “The most effective public health tool available to protect individuals from the flu virus is taking the necessary steps to receive the vaccine. It is not too late to get a flu shot and the vaccine remains fully effective even at this late date. The more of the public who receives the vaccine means a greater reduction in overall influenza illness. Dr. Webby recently penned a guest column in Newsweek encouraging the public to get the flu vaccination – it’s not too late. Many pediatric patients at St. Jude are at a greater risk of getting sick from influenza (flu) and other viral infections because of their diseases and treatments. Therefore, helping to disseminate lifesaving educational information about flu prevention techniques is of paramount importance to the St. Jude Infectious Diseases Department. November through February are peak flu months, and last year’s flu season was one of the deadliest in history. In addition to receiving the flu vaccine, there are also additional simple and effective prevention tips to protect you and your family. Cleaning your hands often with soap and water or with an alcohol-based hand sanitizer. Staying home if you’re sick. Covering your mouth and nose if you cough or sneeze. Also, washing your hands after coughing or sneezing. Avoiding touching your nose and mouth. Our first stop was to eat a nice dinner out, of course. So we took the new purple top into a restaurant that’s normally flawless. It was so far from flawless this time that I’m still in shock. If I’m lucky….if I’m really lucky… my stomach may one day forgive me. They may have turned me against food forever. Yep. It was that bad. So, we laughed that off – knowing the dinner wasn’t the big deal of the evening anyway. We were on our way to that. We should have stayed at the restaurant. Months of anticipation, money that could have paid for more Starbucks trips than I care to calculate, and a great purple top all for naught. So much planning! So much anticipation! Yet, on the way home, all we could do was laugh about it. Somehow…. it just struck us as terribly funny. Isn’t it strange the way things sometimes turn out? You see a movie or show that you really hadn’t thought much about and BAM it knocks your world off its axis. Then you look forward to something for two forevers and boing it bounces off the radar. Oh well. New top, good visit with the spouse, good laughs. Hard to call it a bad evening. During the ride home, it occurred to me just how important humor is. I believe humor is the secret behind taking life’s lemons and making lemonade – the missing ingredient, as it were. I had a really bad burn on my arm one time, courtesy of a grill that decided to shut on me. It hurt 24/7 like the devil, itself, was running up and down my arm. The only time it didn’t hurt was when I had aloe vera gel on it. When the burn was exposed to the elements without the aloe vera gel, it was excruciating. It felt like the tortures of the damned. But as long as my cold, comforting salve was on it, everything was as beautiful and right as Halle Berry’s face. A sense of humor is like a comforting salve for your psyche. It’ll protect you from the burns of life – as long as you remember to put it on. So always keep it nearby, you never know when you’ll need to apply it. Liberally. 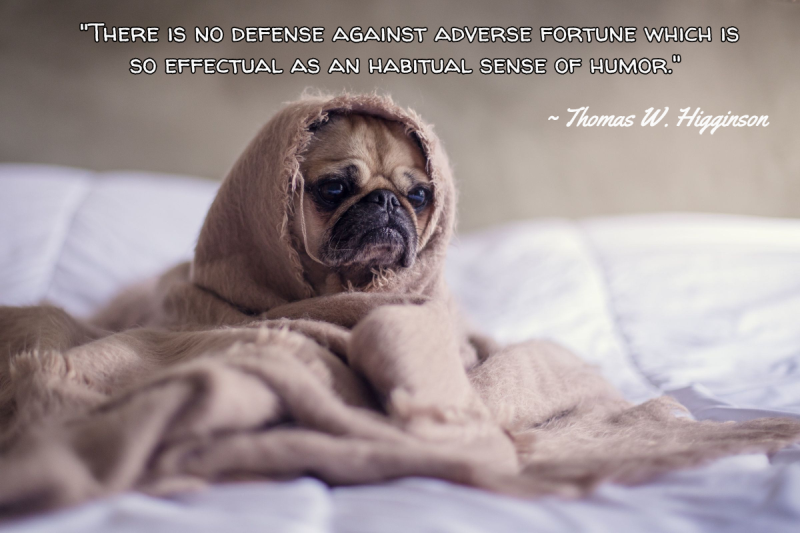 Want more Quotes about Humor? A while back, I wrote an article, “Tips for Living with a Hiatal Hernia: Dealing with the Symptoms Naturally” (linked below) and I continue to hear from people who have a similar condition. Whether it’s in the comments or through e-mail, I’ve learned that a lot of people have this “nightmare” of a situation. I wanted to update my tips because I’ve recently come across a few other things that have helped me a great deal. I hasten to say, obviously, that just because these have helped me DOES NOT necessarily mean that they will help you. However, because there is really so very little information out there about Hiatal Hernias, one of our best bets is to learn from each another. Keep a food journal. 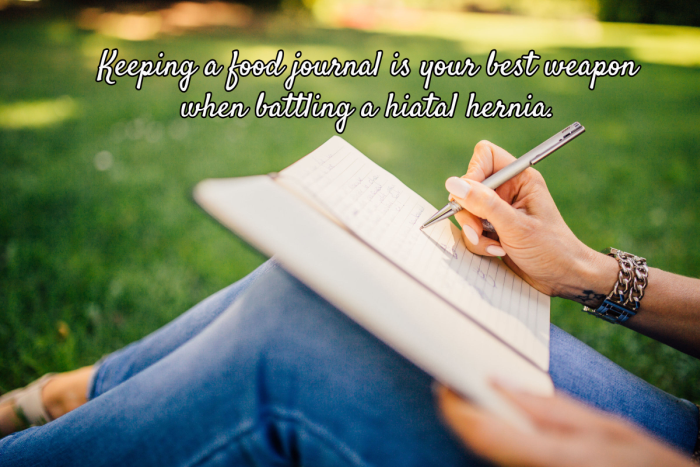 Write down everything you eat and drink as well as whether you experience hiatal hernia problems during or after each meal. If you get hiccups, write it down. If you have heartburn or pain, write it down. If you feel like food is trapped in the esophagus, write it down! Keep an activity journal. The following will show you why this is important. Do NOT lift heavy objects. Some of my worst hiatal hernia episodes occurred after lifting heavy bags of birdseed. Even lifting a heavy trash bag out of a trash can can be too much for a hernia. Don’t move furniture around. This one surprised me but, after an especially bad episode with my hernia (food got trapped for hours and I was in agony), I thought back over what I had done the previous day. I realized I had not lifted anything… then it hit me, I had rearranged some furniture on the carport which meant tugging at a very heavy table and sliding a few chairs around. Apparently pushing and pulling heavy furniture is as bad as lifting it when you have a temperamental hernia. Do NOT hang upside down (inversion tables, playgrounds…). Okay, this one sounds kind of nuts – but it is a nightmare for hernias. I had to give up something I dearly loved (yoga) simply because many of the poses involved too much stress for my hiatal hernia. Eat SLOWLY and chew each bite mindfully. It honestly makes a world of difference. I used to eat fairly fast because I didn’t want my husband or daughters having to wait for me to get through. I quickly decided that I’d rather be the last one eating than to be the first one in pain. In fact, I make a point of even putting my fork or spoon down every now and again to make sure I go slow and easy. Carbonated beverages are not a good idea. AT ALL. Switching exclusively to water and/or tea is the way to go. It can be tough if you’re used to soft drinks but, trust this former Diet Dr. Pepper addict, the improvement is worth it. Besides, tea actually does taste better! Aloe Vera Juice is also something I always keep on hand. It’s wonderful for heartburn, indigestion, and drinking it regularly seems to help with all of my hiatal hernia issues. Due to the fact that I started keeping a VERY thorough food journal (when you’re tired of being in pain, you get drastic! ), I discovered that a few different foods smelled trouble for me. First of all, I found that, more times than not, when I got painful hiatal hernia related hiccups, I was eating chicken or something containing chicken. I even referred to them as “chiccups” because I was almost always eating chicken. So, I decided to give chicken up and see what happened. I saw a huge improvement immediately. Through similar detective work with my food journal, I found that “dense” meats (hot dogs, ribs, pork chops, roast) caused problems for me. Fish, “thin” hamburgers, pulled pork (tender), bacon, and breakfast sausage didn’t give me any problems (thank goodness! ), so I decided to stick with them. I’ve also found that food combinations can cause as much trouble as certain foods, individually, can. If rice, for example, is paired with a meat – I am apt to have issues. So, if I’m eating rice with meat, I now know to eat very, very slowly and chew my food like my very life depends upon it. Your food journal will help you discover problematic foods as well as combinations. Having a journal helped me discover that thin hamburgers weren’t the problem – it was the bread they were on. Most people with hiatal hernias cannot tolerate bread at all. My journal also saved me from having to give up shrimp. I found that it wasn’t the shrimp, itself, that was the problem (although I do now eat extra slowly when eating shrimp) – the problem was the combination of shrimp with rice, two foods I almost always paired. An individual with a hiatal hernia has an esophagus that’s under a lot of stress – the esophageal sphincter (LES), in particular, takes a beating when the hernia is doing its thing. Fortunately, we can help heal the area and improve inflammation by eating and drinking things that aren’t acidic or harmful. We can also promote healing with licorice – one of the few things shown to help heal the inflammation. I take a licorice capsule daily and have for about a year. I would highly recommend it for anyone with a hiatal hernia. Not only does the hernia, itself, wreak havoc on the esophagus, the acid reflux we frequently experience does as well. Here is an excellent article I found online: 5 Supplements That Heal Tissue Damage Caused By Acid Reflux. Excellent advice, here. Welcome to Self Help Daily, a blog devoted to helping you get the most from life by getting the most from yourself! Read the story behind the picture above in How to Live in the Moment. When you see an article labeled “Articles by Other Authors,” this means the post is either a sponsored post or a post by a freelance writer, looking to build his/her online portfolio. All posts written by me are signed with my name ~ Joi. You Can (Almost) Always Find What You’re Looking For… So Be Careful What You Seek! The Fascinating World of Essential Oils and Aromatherapy: Benefits Beyond Belief! One of the questions I hear the most from my readers is, "How can I cope with empty nest syndrome?" I'll try to deal with this sensitive subject as often as possible. If you have any suggestions, I hope you'll contribute to the conversations! Don't Just Cope in an Empty Nest, Thrive!